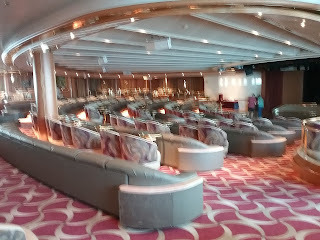 This was our first time on this class of Princess ship. She is 20 years old and was refurbished in November 2017. Basically, she was in very good shape. 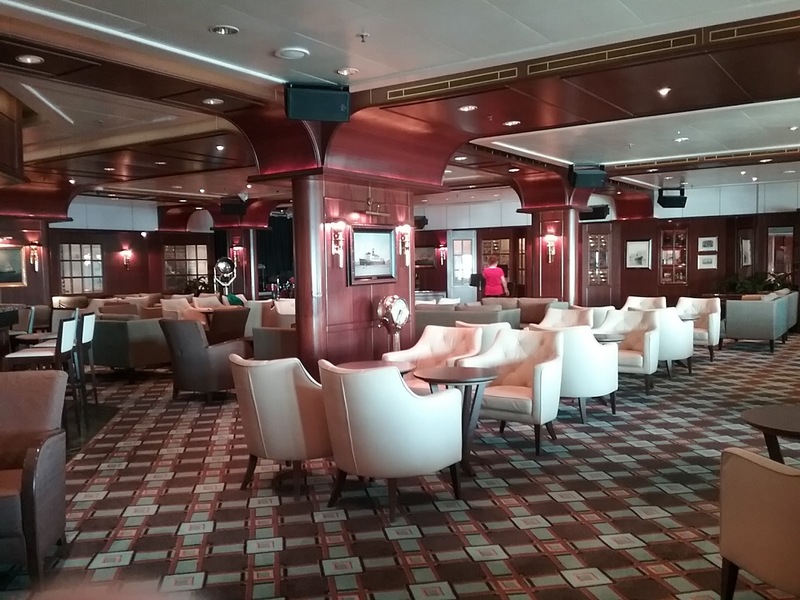 The only issue we had was with some of the 'soft goods' in the open areas around the ship. 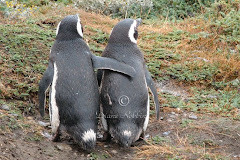 They seemed a bit tired and we ended up avoiding those areas. Too bad because those areas looked like they should be nice quiet, comfy areas to sit and read. That said, except for one small thing, we loved our cabin. 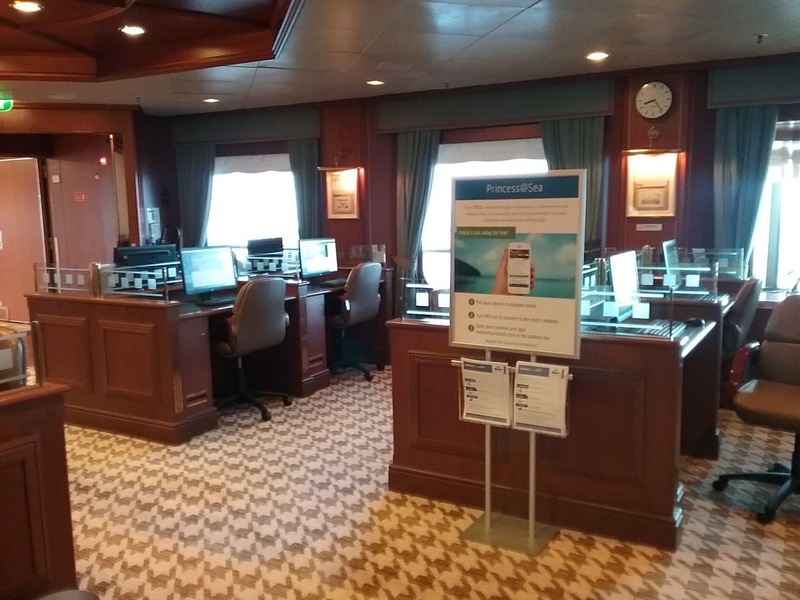 We had a mini-suite and on the Sea Princess, the cabin is L-shaped. The bathroom had a door from the bedroom and a door from the sitting area, with a door between the sink/toilet and shower/tub area. The loveseat in the sitting area opened into a bed so this, along with the curtain between the bedroom and sitting room, made a perfect cabin for three people. The only place I had an issue with was the bathroom. As you can see where my husband is washing up, the sink area is small. 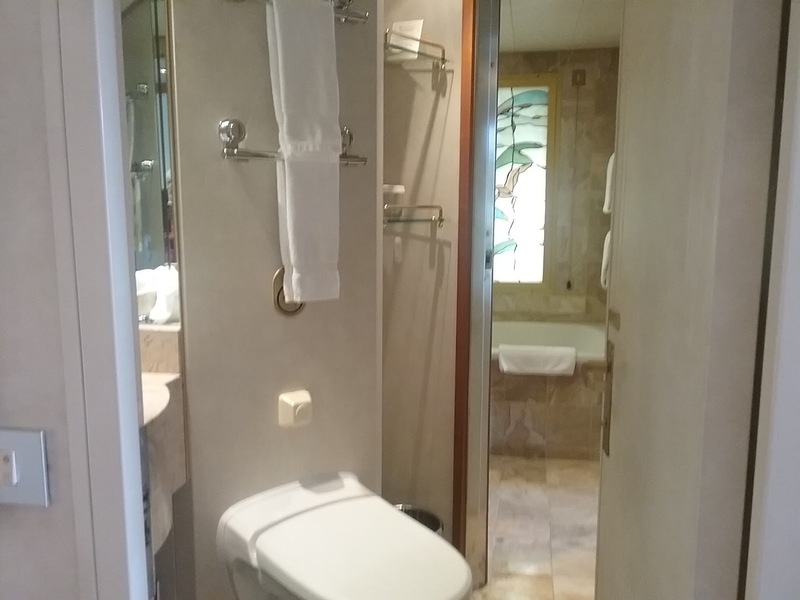 Just to the right of the toilet are two small, triangular-shaped shelves (you can see the edge of one in the picture ... glass shelf with gold-colored rail) for storage. Essentially, very little storage space. But we adjusted ... kept minimal in the bathroom and the rest we put elsewhere. Plenty of tabletop space in the cabin with a desk in the sitting area and another in the bedroom. We had a long balcony, with sliding doors in both the bedroom and the sitting room although the upholstered chair in the sitting room was in front of the door and would need to be moved to get out onto the balcony that way. 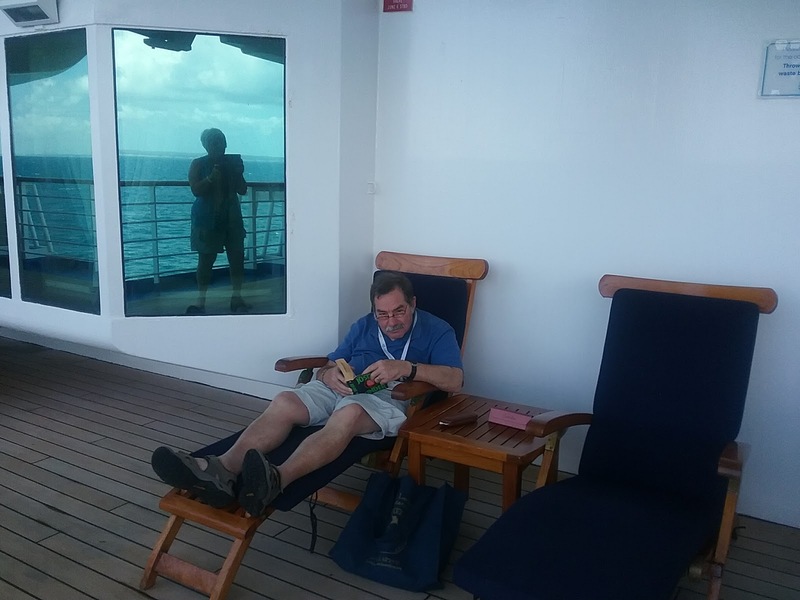 Besides the table, there were two chairs with footrests. I'm sitting on the second chair to take this picture and there is another 'cutout' - opening - to my right like you see in the picture where my husband is sitting. 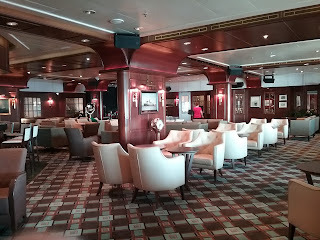 And some pictures around the ship. 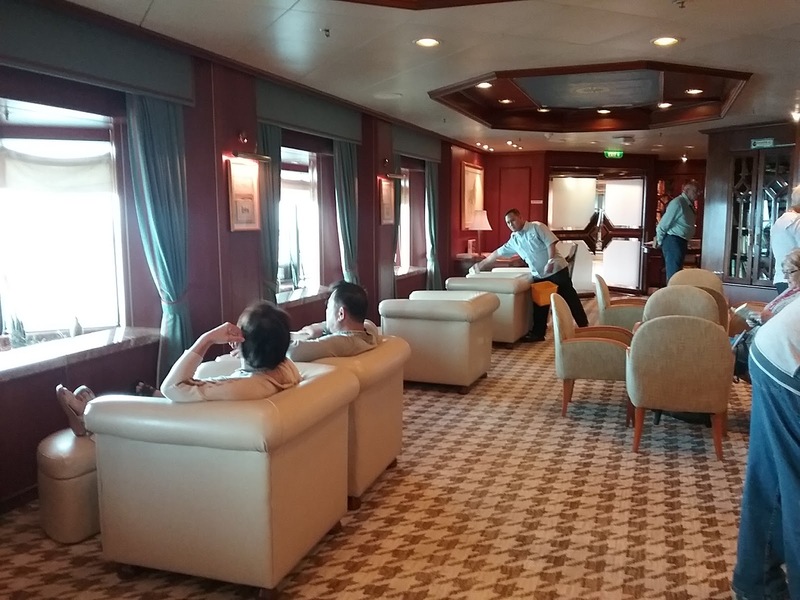 Beautiful wide promenade deck which many passengers made good use of. We did too. 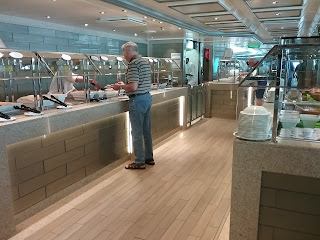 We were disappointed with the lack of variety of the menu in the main dining room. Over 28 days it got very repetitive. Lamb was offered a lot. Very little chicken on the menu unless it was part of a pasta dish. Sometimes there were two fish offerings, which I usually don't eat. That said, I did have the 'available anytime' Tasmanian salmon and it was excellent. But one night my husband and I were reduced to ordering the Aussie Burger off the 'available anytime' menu which I think is a pretty poor option for the MDR. And only two nights were we offered Chocolate Journey. (For non-Princess cruisers, these are Norman Love chocolate designer desserts that are to DIE for.) This was a 28-day cruise! We sailed the Med last year (21 days) and they were offered about every 3rd or 4th night. The only reason I can think of is that there were a lot of short segments within those 28 days. But still ... And lobster tails also only one night. That said, the food we had was good to excellent. We were happy with the buffet, although sometimes it took a while to find a table. And the room service we ordered twice came very fast and was 100% correct. Oh ... if you are a lover of Princess chocolate chip and double chocolate chip cookies, they are still available at the dessert area of the buffet but most times you had to ask for them. As for activities, there is no shortage. My husband and I love trivia and there were at least three per day ... two in the Vista Lounge during the day and one in Legends in the evening. On sea days there was an additional one in the afternoon. Sometimes there would be another one in the evening. During the sea days, there were your typical classes i.e. health, fitness, etc. There were culinary displays and, of course, the opportunity for lots of shopping. 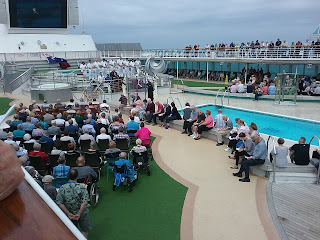 But we also had lectures about Australia and WW II and they were very well attended. 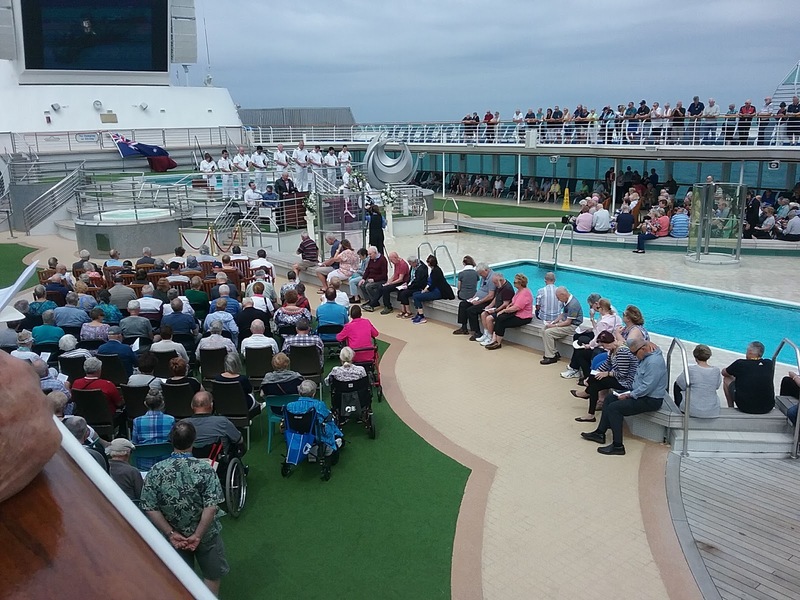 We had a memorial service on the open deck when the Sea Princess passed near the site of the sinking of the HMAS Sydney II. And that was extremely well attended. 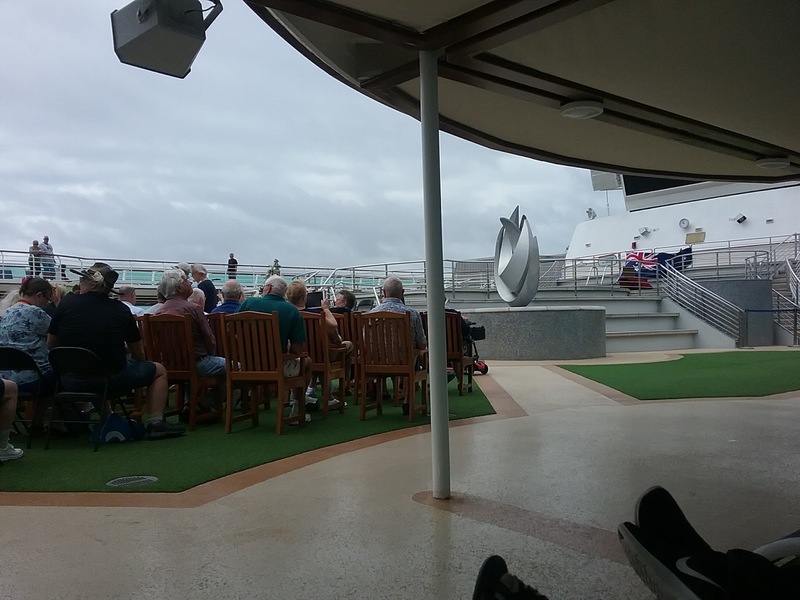 Did any of this affect our cruise? No, not really. We know as travelers that there are times you have to adapt. And adapt we did so that things worked for us. Our cabin was comfortable. We loved the balcony. The ship was easy to get around. We had a great cabin steward and waiter and assistant waiter. We never had an issue with lines. In the end, I always ask myself if this is a ship I would sail on again. Absolutely! Don't take that as being "normal" for the buffet!!!!! 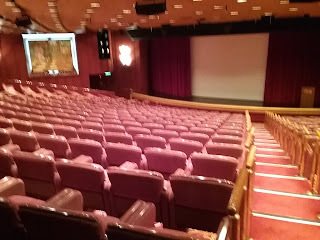 It is usually CROWDED! !